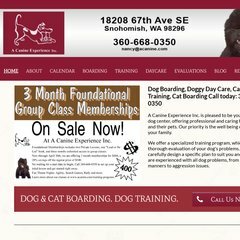 Topics: A Canine Experience, Boarding, Dog Boarding, Cat Boarding, and Training. acanine.com Snohomish Dog Training, Lake Stevens Canine Obedience for Everett ..
acanine.com Snohomish Dog Daycare, Mill Creek Canine Boarding, Lake Stevens ..
dogs-a-jammin.com Dogs-a-Jammin' | Dog Boarding & Doggie Day Care | Seattle .. It has 2 DNS records, ns1.bluehost.com, and ns2.bluehost.com. It is hosted by Bluehost Inc (Utah, Provo,) using Apache web server. Acanine.com's server IP number is 66.147.244.211.